The best thing about the putter is TaylorMade's insert. This "Anti-skid Groove System Insert technology features fourteen tightly positioned grooves." This gives the putter a soft feel while promoting a forward spin and smooth roll. When you stoke a putt with this insert, the ball stays on the putter face longer gripping it and causing it to come off rolling instead of jumping off of the face. 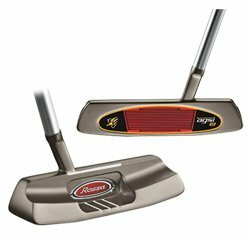 This putter is similar to a couple of other putters that I would recommend you take a look at: the Wilson Staff 88 Series Putter and the Odyssey White Hot Tour #1 Putter. I prefer the Odyssey White Hot Tour #1 the best out of the three (including this Lambeau Putter). The Odyssey is cool because it has "tour-tuned" weight ports in the sole which gives the putter the perfect balance and feel.